He and others spoke to McClatchy on condition of anonymity because the study isn't due to be shared with Congress and released before Wednesday. President Bush and his aides used Saddam's alleged relationship with al Qaida, along with Iraq's supposed weapons of mass destruction, as arguments for invading Iraq after the September 11, 2001, terrorist attacks. Then-Defense Secretary Donald H. Rumsfeld claimed in September 2002 that the United States had "bulletproof" evidence of cooperation between the radical Islamist terror group and Saddam's secular dictatorship. 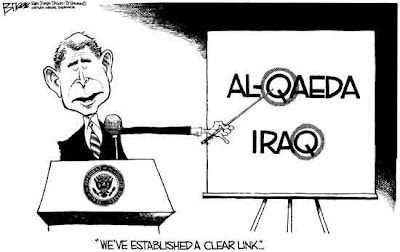 As recently as last July, Bush tried to tie al Qaida to the ongoing violence in Iraq. "The same people that attacked us on September the 11th is a crowd that is now bombing people, killing innocent men, women and children, many of whom are Muslims," he said. The new study, entitled "Saddam and Terrorism: Emerging Insights from Captured Iraqi Documents", was essentially completed last year and has been undergoing what one U.S. intelligence official described as a "painful" declassification review. It was produced by a federally-funded think tank, the Institute for Defense Analyses, under contract to the Norfolk, Va.-based U.S. Joint Forces Command. Spokesmen for the Joint Forces Command declined to comment until the report is released. One of the report's authors, Kevin Woods, also declined to comment. The issue of al Qaida in Iraq already has played a role in the 2008 presidential campaign. Sen. John McCain, the presumptive GOP nominee, mocked Sen. Barack Obama, D-Ill, recently for saying that he'd keep some U.S. troops in Iraq if al Qaida established a base there. The new study appears destined to be used by both critics and supporters of Bush's decision to invade Iraq to advance their own familiar arguments. While the documents reveal no Saddam-al Qaida links, they do show that Saddam and his underlings were willing to use terrorism against enemies of the regime and had ties to regional and global terrorist groups, the officials said. However, the U.S. intelligence official, who's read the full report, played down the prospect of any major new revelations, saying, "I don't think there's any surprises there." Saddam, whose regime was relentlessly secular, was wary of Islamic extremist groups such as al Qaida, although like many other Arab leaders, he gave some financial support to Palestinian groups that sponsored terrorism against Israel. According to the State Department's annual report on global terrorism for 2002 — the last before the Iraq invasion — Saddam supported the militant Islamic group Hamas in Gaza, Palestinian Islamic Jihad and the Popular Front for the Liberation of Palestine-General Command, a radical, Syrian-based terrorist group. Saddam also hosted Palestinian terrorist Abu Nidal, although the Abu Nidal Organization was more active when he lived in Libya and he was murdered in Baghdad in August 2002, possibly on Saddam's orders. An earlier study based on the captured Iraqi documents, released by the Joint Forces Command in March 2006, found that a militia Saddam formed after the 1991 Persian Gulf war, the Fedayeen Saddam, planned assassinations and bombings against his enemies. Those included Iraqi exiles and opponents in Iraq's Kurdish and Shiite communities. Other documents indicate that the Fedayeen Saddam opened paramilitary training camps that, starting in 1998, hosted "Arab volunteers" from outside of Iraq. What happened to the non-Iraqi volunteers is unknown, however, according to the earlier study. The new Pentagon study isn't the first to refute earlier administration contentions about Saddam and al Qaida. The Senate report, citing an FBI debriefing of a senior Iraqi spy, Faruq Hijazi, said that Saddam turned down a request for assistance by bin Laden which he made at a 1995 meeting in Sudan with an Iraqi operative.